In the current market environment where 25%* of the global bond market trades at negative yields, investors’ interest and demand for unconstrained total return-oriented fixed income strategies has picked-up and resulted in the proliferation of such strategies. This phenomenon has left investors sometime confused and disappointed by the ability of the asset managers to deliver on their promises of attractive returns. During this webinar, John Taylor, member of the Absolute Return portfolio-management team, will discuss the opportunity for unconstrained fixed income investing and describe how, at AB, our investment philosophy and expertise in multi-sector investing has enabled us deliver on our risk-adjusted return objectives consistently across market cycles. Please join us for a call with Morgan Harting, Lead Portfolio Manager of the Emerging Markets Multi-Asset team. Morgan will provide us his insights on major macroeconomic themes and risks in emerging markets. In addition, he will discuss current positioning and performance of the portfolio. Finally, he looks forward to taking your questions in an interactive session on markets as well as the fund strategy. Europe’s investing landscape is complicated, but there are compelling reasons to reassess regional markets today. In this live interview, Andrew Birse, fund manager of AB's European equity portfolio, explains how his team bring a private equity-like approach to public markets, directly engage with short sellers for a broader perspective of risk and why bringing a global perspective to European stocks leads to overlooked investment opportunities. Earning investment income today is a challenge, and it’s not getting any easier. Yields are low, and over the next ten years, traditional stock and bond portfolios are expected to earn less than half of what they did over the previous five. Investing for income poses a problem, particularly for those approaching retirement, who need to generate a steady stream of income without suffering large drawdowns. Based on the saver’s needs and outcome objective, a multi-asset income solution can draw on the best opportunities across the globe to deliver investors with income, with different distribution options to provide flexibility. But not all multi-asset income approaches are created equal, and investors must consider how diversified the solution is, how dynamic and flexible their manager can be, and how the manager looks to generate alpha. Please join Karen Watkin from the AB Multi-Asset team to discuss key issues in the current environment. European fixed income investors face a dilemma. The increasing cost of hedging from US dollars into euros has made European fixed income investments more attractive on a relative value basis. But political turmoil in Italy, a potentially less accommodative monetary policy from the ECB and trade wars have increased uncertainty. 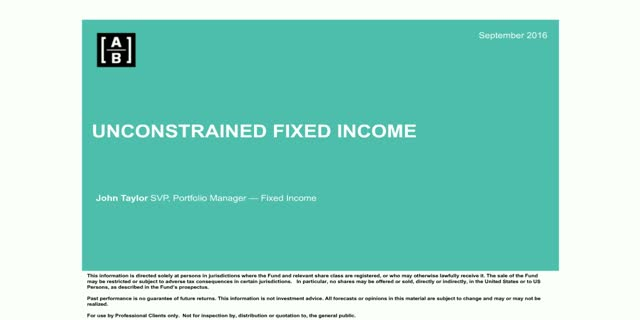 Please join the AB European fixed income investment team to discuss how investing in Europe in the current environment can help you generate additional return. Think back to the beginning of 2017. It was full of uncertainty and concern. Yet, it ended up being a great year. Most major asset classes posted positive returns. Stocks, both US and international, had a very strong year—as did credit markets like high yield and emerging-market debt. Even conservative government bonds posted positive returns, and alternatives were on the plus side too. AllianceBernstein portfolio manager Stuart Rae explains how lessons from classic behavioural finance studies can help investors improve the choices they make today. Following a remarkable year of returns, many investors are questioning US equity valuations and whether there is further upside potential for US stocks. Join Kurt Feuerman as he reviews 2017, provides his outlook for US markets in 2018, and discusses how he’s positioning his strategies to manage risk and identify opportunities in the new year. Many people are looking for ways to invest that benefit society and the environment—but they’re worried about sacrificing returns in the process. In this video, Sammy Suzuki, Stuart Rae and Kent Hargis, managers of the AB Emerging Markets Equity portfolio, explain why managing risk is the key to capturing return potential of emerging market stocks. Portfolio Manager Sammy Suzuki explains why emerging market companies will need to adapt to a more protectionist world. Portfolio Manager Morgan Harting explains how a portfolio of stocks, bonds and currencies could prove a smarter way to buy into emerging markets’ upside. How can investors discover stocks with long-term return potential, even in an environment of political and economic uncertainty? Join us for an interactive session with our fund manager and learn how it’s possible to invest successfully in European Equities. 1. Find out how AB’s European Equity portfolios have successfully navigated changing market conditions by focusing on companies—and not countries. 2. Discover why the key to identifying winners is to look for European companies that are global leaders and less exposed to regional trends. 3. Learn how techniques used by private equity investors can be very effective when applied to stockpicking in public equity markets. Tawhid Ali has served as Chief Investment Officer of European Value Equities since 2012, having been the division’s Director of Research since 2008. Ali was previously a research analyst covering retail and leisure stocks in Europe. He was also appointed Portfolio Manager of Global and International Value Equities in March 2016. Nicholas Davidson joined AB in 2005 as a Senior Portfolio Manager. He works with clients across a range of AB’s global and regional equity services, and comanages the Global Equity Income Portfolio. Davidson was previously a consultant with McKinsey & Company, serving clients in the telecommunications and media industries and in the public sector. CIO Tawhid Ali and Portfolio Manager Andrew Birse explain the techniques they use to find stocks with long-term return potential in today’s complex regional landscape. With financial markets firmly in “risk-on” mode, many investors worry about a sudden return of “risk-off” sentiment. Jose Cosio, Managing Director—Global Client Group, and Jim Chanos, founder of premier short-only and market neutral manager Kynikos Associates LP*, are hosting a webinar to examine which alternative strategies could help investors weather less exuberant markets. A new political regime in the US brings new risks and new rewards for US equity investors. Join Kurt Feuerman as he discusses his outlook for US markets and how he has adjusted his strategies to manage risk and identify new opportunities. With traditional safe-haven assets paying skimpy (even negative) yields, many investors realize that they may have to move up the risk curve to meet their long-term needs. But the bouts of volatility that have plagued equity markets can seem too risky to take on. We believe that efforts to not lose money can be harnessed to grow capital over time. To hear more, please join Kent Hargis & Sammy Suzuki, Portfolio Managers—Strategic Core Equities, for an interactive discussion on reaching long-term goals with “The Upside of Less Downside”. Please join Tawhid Ali, Chief Investment Officer—European Equities, for an interactive debate that will ask why some areas of high return potential continue to be overlooked by many investors. Tawhid will also consider the European equity landscape and the significant opportunities that mispricings can create for skilled stock pickers. Join our panel of portfolio managers – each with a distinct, active, high-conviction approach – as they discuss the current opportunity and outline the techniques they employ to locate resilient sources of growth in today’s challenging US equity market environment. AB provides forward-looking perspective, independent research and investment discipline across asset classes, from equities and fixed income to alternatives and multi-asset portfolios.